What amount of space will be necessary for preparation? Does the caterer have tastings? In case there is none, reviews from others may be necessary. How many catering staff members will be in the venue? What exactly will they do? What cooking equipment will be included? Will the caterer provide tea and coffee? How will the catering staff wear? Will their dress code suit your event? When will your caterer need to know the final number of guests and dietary requirements? Is the catering service provider able to meet different dietary requirements? Will the provider serve your wedding photographers, children, neighbours, and other people besides the invited guests? Will the staff do all the cleaning after the event? What will happen to the any food that is left over? Say after a buffet for instance. 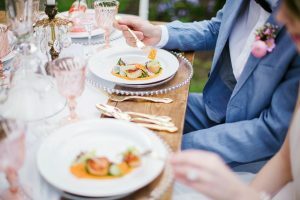 Since catering takes the lion’s share of your wedding budget, it is always good to get it right. If you can find a caterer who can provide correct answers to the above questions a, then you will have probably landed a good fit. We hope your wedding day goes very well.